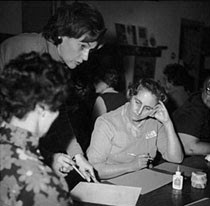 Jane N. Graff's life's work had been to provide program support to UW Extension Faculty as a professor in the Department of Related Art within the University of Wisconsin School of Home Economics (currently known as the School of Human Ecology). She worked in this capacity for 32 years, following which she received professor emerita status. Beginning her career with the University in 1959, Professor Graff lived "the Wisconsin Idea" through her to outreach to Wisconsin families by way of newsletters, radio, television and other media. Her principal focus was the home environment and its impact on the Wisconsin family. By the 1970s her passion for textiles led to her work with 4-H groups in textile design and fueled her research into historic quilts. She was deeply involved with the Helen Louise Allen Textile Collection in the School of Human Ecology. In fact, her commitment to the collection is reflected in her endowment of a position for a research assistant to work with the materials. Professor Graff passed away on August 7, 2008 at the age of 81. In death, she demonstrated the same generosity that characterized her life. Her generous bequest to the Wisconsin Trust for Historic Preservation, Inc. has been the central impetus behind the current revitalization of the organization. As we carry the mission of the Wisconsin Trust forward, Professor Graff always will remain an inspiration for her dedication and generosity.